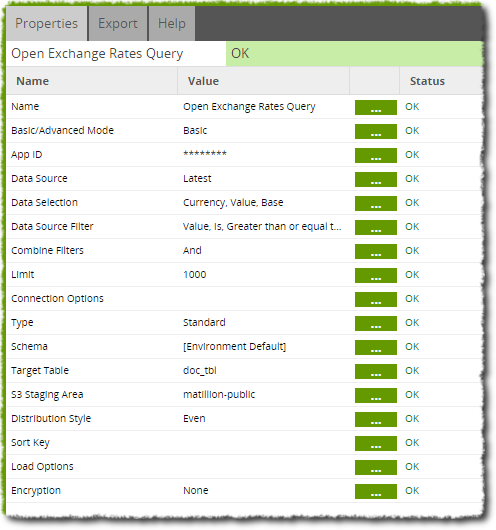 This component uses the Open Exchange Rates API to retrieve data and load it into a table. This stages the data, so the table is reloaded each time. You may then use transformations to enrich and manage the data in permanent tables. 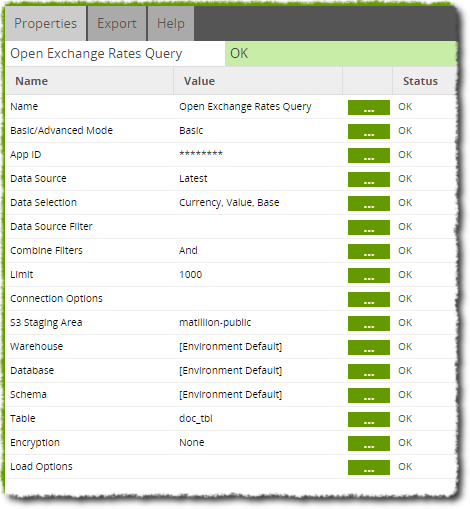 The component offers both a Basic and Advanced mode (see below) for generating the Open Exchange Rates API query. Note however that although this is exposed in an SQL-like language, the exact semantics can be surprising - for example filtering on a column can return more data than not filtering on it, an impossible scenario with regular SQL. There are some special pseudo columns which can be part of a query filter, but are not returned as data. This is fully described in the data model. Note: The available features and numbers of API requests is dependent on your Open Exchange Rates pricing plan. You may get errors (such as '403 Forbidden') when attempting to use features your account does not have access to. 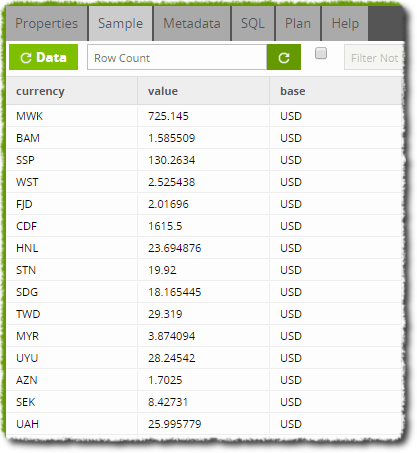 Basic/Advanced Mode Choice Basic - This mode will build a Open Exchange Rates Query for you using settings from Data Source, Data Selection and Data Source Filter parameters. In most cases, this will be sufficient. Advanced - This mode will require you to write an SQL-like query which is translated into one or more Open Exchange Rates queries. App ID Text Enter an Open Exchange Rates App ID associated with your account. These can be stored on the component or in a KMS wallet. Data Source Choice Select a data source. Note: The TimeSeries Data Source requires a paid account, otherwise a '403 Forbidden' error message will be given when loading data. Combine Filters Text Use the defined filters in combination with one another according to either "and" or "or". Limit Number Fetching a large number of results from Open Exchange Rates will use multiple API calls. These calls are rate-limited by the provider, so fetching a very large number may result in errors. SQL Query Text This is an SQL-like query, written according to the Open Exchange Rates data model. Connection Options Parameter A JDBC parameter supported by the Database Driver. The available parameters are determined automatically from the driver, and may change from version to version. Parameters can be found in the data model, found here. They are usually not required as sensible defaults are assumed. Value A value for the given Parameter. 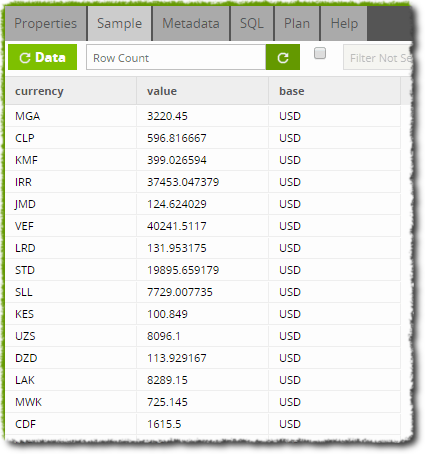 The parameters and allowed values for the Open Exchange Rates data model are Connection String Options as listed here. Key - distribute rows around the Redshift cluster according to the value of a key column. Sort Key Select This is optional and specifies the columns from the input that should be set as the table's sort-key. Sort Key Options Select Decide whether the sort key is of a compound or interleaved variety - see the Amazon Redshift documentation for more information. Encryption Select Decide on how the files are encrypted inside the S3 Bucket. Time Taken To Load The amount of time (in seconds) taken to load the data into the target table from the staging area. 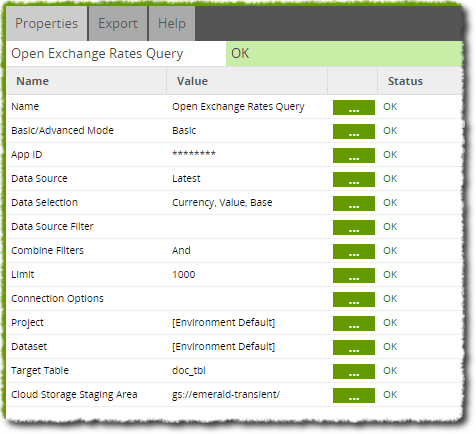 Connect to the Open Exchange Rates Server and issue the one or more queries. Stream the results into objects into a storage area, recreate or truncate the target table as necessary and then use a COPY command to load the stored objects into the table. Finally, clean up the temporary stored objects. In this example we want to load some data from Open Exchange Rates into a table. We want to analyse recent transactions but preferably ignore any that we deem to be too small to be significant. Thus, we use a data filter to remove any sub-$100 transactions. The job is shown below. We now set up our Open Exchange Rates Query components. We have entered our API ID and selected the 'Latest' data source to pull in recent transactions. We are planning to load this into a the table 'doc_tbl'. This data has a filter attached that takes only data where the value equal to or over $100. After running the job, we can sample the data using a Table Input component in a Transformation job. The sample includes no examples under $100 value. The non-filtered data is also shown below for the sake of comparison.